The living room or lounge at the Riifflin'Hitch Lodge in Southern Labrador is the ideal place to enjoy a cocktail with friends or curl up in front of the fire and read a book after fishing all day. The soft golden lighting of the lounge shimmers around the fireplace which is centered against the brick wall in the interior of the fishing lodge. 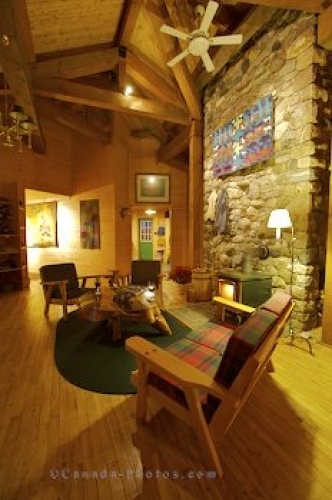 Photo of the elegance of the living room lounge at a fishing lodge in Southern Labrador, Canada.